EREMA electric heating elements, composed of recrystalized high-purity silicon carbide, have earned a reputation as being the Worlds leading heating elements since their first commercialization in Japan. We value our customers' feedback, and continue to implement changes and improvements in the quality of EREMA products. With our experience and advanced technologies we are continually developing products to meet the challenge of new applications and industries. With the largest production capacity in the World, and wide range of quality products, we are able to support our customers by supplying the most appropriate heating element for any given application. · EREMA generates high heat output per unit surface area, approximately 5-10 times the output of Nichrome wire. 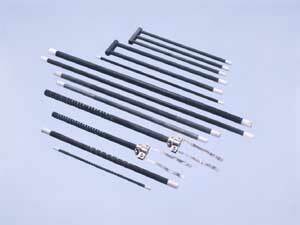 · EREMA has high strength and excellent shock resistance. · EREMA is chemically very stable. · Heat source is free of noise and air pollution. · Various coating products are available for protection against water vapor and harmful gas atmosphere. · EREMA is easy to handle.